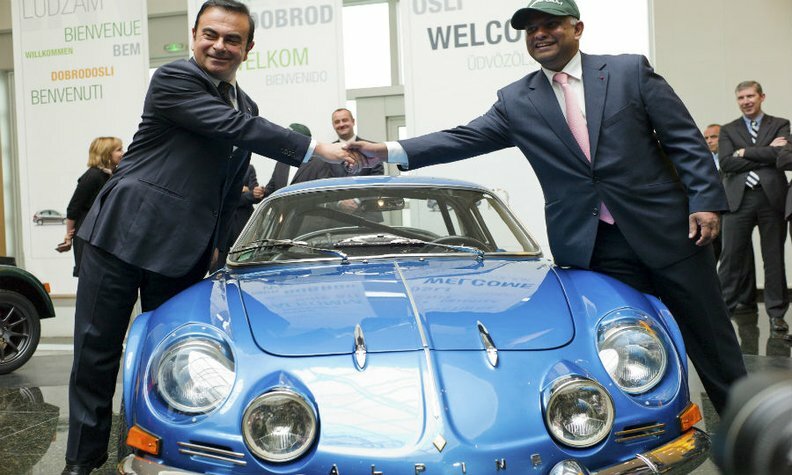 Renault CEO Carlos Ghosn, left, and Caterham boss Tony Fernandes shake hands over an Alpine vehicle after their 2012 announcement of a joint venture to develop sports cars. SINGAPORE (Bloomberg) -- Caterham owner Tony Fernandes plans to sell the Caterham group of automotive and engineering companies, the Edge Malaysia newspaper reported. The 50-year-old Malaysian businessman is seeking about 350 million pounds (432 million euros) for the assets that include UK sports car manufacturer Caterham Cars Ltd. and the Caterham Formula One racing Team, the newspaper said, citing a person it didn't identify. An information memorandum on the sale is being circulated in the Middle East, Edge Malaysia reported. Fernandes didn't respond to requests for comment. In March, reports said that Caterham was ending a partnership with Renault in which the two planned to revive the French carmaker's Alpine brand. The two companies signed an agreement in 2012 to roll out the first of their jointly designed, developed and manufactured cars in 2016. Renault still plans to continue solo development of an Alpine roadster, a source told Reuters in March. The reported sale of Caterham follows Fernandes's warning in January that funding to the F1 Team would stop if performance didn't improve, the newspaper reported. The Caterham-Renault racing team failed to win a single point in the 2012 and 2013 seasons, as well as in the first five races this year, official FIA results showed.